You can also find information about the following mills on this interactive map. 1841 directory: Clegg Jas & Co., cotton spinners and manufacturers, Vale mill. 1848: Named on OS map as Vale Mill (cotton). 1880 directory: Clegg James & Co., Vale mill, and 14 New Brown St., Manchester. 1880 directory: Wood Richard, Esq., J.P., cotton manufacturer, Vale Mill and John Street and High Street Mills; h. Plumpton Hall. 1888 directory: Vale Mill Manufacturing Co. Vale St.
1907: Marked on OS map as Vale Mill (cotton). 1922 directory: Operated by Dahby Towels; Parkinson, J. 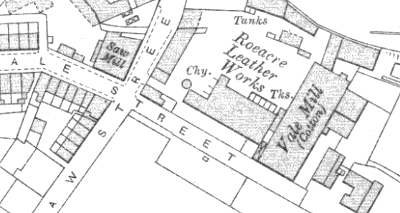 1928: Merged on OS map with Roeacre Leather Works. Vale Mill, OS map, 1907. 1848: Possibly no building here on OS map - markings are unclear. 1851: Small building marked on OS map as Victoria Boiler Works. 1875 directory: Hill Thomas and Sons, Victoria Boiler works, Heywood. 1890: Named as Victoria Boiler Works on OS map. 1907: Marked on OS map. 1927: Building present but unnamed on SP map. 1937: Building not present on OS map. Victoria Iron Works, OS map, 1907. 1847: Not present on OS map. 1871 directory: Tattersall James, Victoria and Gregge street mills, Pitfield mills, Bamford, and 27a, Fountain street, Manchester. 1891 directory: Phoenix Mills, Tattersall James and Sons, Limited, Victoria and Gregge Street Mills; 38,000 spindles, 169/448 weft, 128/288 warp ; and at Pitfield Mills, Bamford; Manchester office-14, Brown street. 1917: Healey Bros. were operating here. 1937: Marked on OS map as ‘cotton waste’ works. 1947: Still present on OS map. 1957: Building not present on OS map. Victoria Mill, OS map, 1907. Reported to have been built during the early 19th century and cited as a 'Mowheel pit, textile mill, water mill, and spinning mill'. 1847: Marked on OS map as Wash Mill (spindle). 1880 directory: Shepherd James, waste bleacher, Wash Mill, Birtle. 1894: Marked on OS map as Wash Mill Works (disused). 1956: Marked on OS map as Wash Mill Works (disused). Wash Mill, Ordnance Survey map, 1847. 1848: Marked on OS map as Water Mill (woollen). 1890: Marked on OS map as Water Mill. 1891 directory: George Clough, Spring Street Mill; and finisher at Water Fold Mill, Heap Bridge; 100 looms, cloths, blankets and flannels. 1908: Marked on OS map as Water Fold Mill (woollen). 1928: Marked on OS map as Water Fold Mill (disused). 1956: Marked on OS map as Water Fold Mill (disused). 1968: Some buildings still present on OS map. 1973-75: The M66 was built through this site. Water Fold Mill, OS map, 1847. 1850 directory: Harrison James and John, Well meadow and Moss field Mills (cotton spinners and manufacturers). 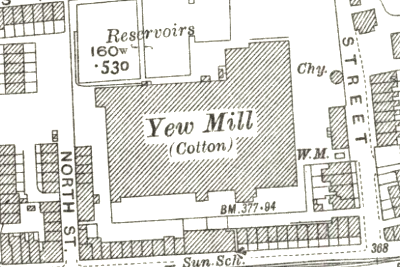 1851: Marked on OS map as Well Meadow Mill (cotton). 1871 directory: Norris Brothers (fustians), Wellmeadow and Mossfield Mills, and 36 Cannon street, Manchester (cotton spinners). 1880 directory: Norris Brothers, cotton spinners and manufacturers, Well Meadow Mill (cotton spinner and manufacturer). 1891 directory: Norris Brothers, 19,676 spindles; 714 looms, fustians; Manchester warehouse -36 Cannon street. 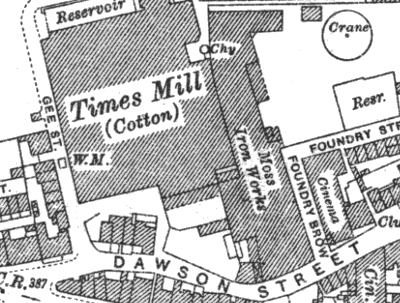 1908: Marked on OS map as Times Mill. 1922 directory: Times Coloured Spinning Co.
1993: Salford Electronic Instruments closed. Times Mill, OS map, 1937. 1848: Named on OS map as Wham Lane Mill (cotton). 1850: Hamer Bartholomew, (Executors of) Wham bar Mill. Wham Bar Spinning Co., Limited, cotton spinners; Geo. Ashton, manager; James Rothwell, secretary. 1890: Named as Wham Bar Mill (cotton) on OS map. 1891: Wham Bar Spinning Co, Limited, Bury St.; 22,200 spindles, 308/508 weft, 308/368 twist, 248/328 ring yarn. 1908: Buildings not present on OS map. Wham Lane Mill, OS map, 1847. 1818: Possibly marked on Greenwood's 1818 map as ‘Steam Mill’. 1829 directory: Jonathan Collinge, Wam Mill. 1841 directory: Collins Jonathan, jun. cotton spinner, Wham mill; Collins Jonathan, Wham house. 184 directory3: Samuel Schofield managing Wham Mill. 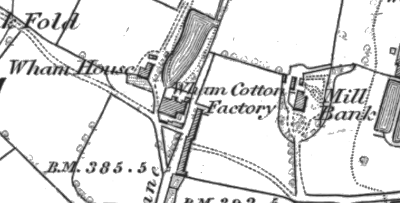 1848: Marked on OS map as Wham Cotton Factory, Wham Lane. 1850 directory: Schofield Samuel, Wham Mill (cotton spinners). 1871 directory: Riley William & Co. (manufacturers), Wham mill. 1875 directory: Harwood Robert, Wham mill, Heywood. 1880 directory: Wham Mill Spinning Co., Limited, cotton spinners, Stanley Street; Wm. Ashworth, secretary. 1888 directory: Taylor James, Wham Mill, Stanley St.
1891 directory: James Taylor, Stanley street; 7,000 ring spindles, 168/248 extra hard twist. The mill buildings appear to have become a part of the neighbouring Derby Mills during the following decades. Wham Mill, OS map, 1847. 1891: Mill marked here on OS map. 1907: Marked on OS map as cotton mill. 1957: Named on OS map as Willow Street Mill (cotton). 1986: Still present on OS map. Willow Street, OS map, 1907. 1924: Built for Robert Barker Limited (est. 1919), manufacturers of reeds and healds. 1928: Marked on OS map as Reed and Heald Works. 1957: Marked on OS map as Wilton Works (Reeds and Healds). 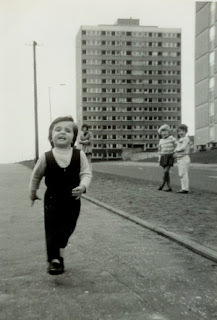 1980: Saville Whittle took over building. Note: The Heald is part of the weaving loom which moves the thread up and down. The Reed is a comb-like device which controls the separation of the warp threads. Wilton Works, OS map, 1937. 1880 directory: Buckley Benjamin, cotton spinner, Woodfield Mill; h. 52 Dewhurst Street. 1888 directory: Buckley Benjamin, cotton spinner, Woodfield Mill (cotton spinner). 1957: Marked on OS map as Woodfield Mill (industrial gloves). The business operating here was Tedson & Thornley, who also owned the neighbouring Rhodes Mill. Woodfield Mill, OS map, 1907. 1848: Marked on OS map as Woodhouse Mill (bleaching). 1890: Marked on OS map as Woodhouse Mill (woollen). 1891 directory: Kelsall and Kemp, Limited (and fullers and finishers), Woodhouse Mills. 1908: Marked on OS map as Woodhouse Mills (dyeing and finishing). 1923: Marked on OS map as Woodhouse Mills (dyeing and finishing). 1961: Marked on OS map as Works. Most of the buildings were demolished after 2005, although a few remain. Woodhouse Mills, OS map, 1890. 1848: Not present on OS map. 1883 directory: Brierley James, brewer, Woolpack Brewery, & shopkeeper. 1890: Marked on OS map as Woolpack Brewery. 1907: Still in use as a brewery. 1927: Marked on OS map as Woolpack Brewery (disused). 1947: Building still present on OS map. 1956: Building no longer present on OS map. Note: The Woolpack pub has been on nearby Birch Street since at least 1880. Woolpack Brewery, OS map, 1890. 1777: Owned by James Kershaw, opened as the first cotton production mill in Heywood. 1829 directory: John Bentley, cotton spinner, Wrigley Brook. 1829 directory: James Kershaw and Sons. 1841 directory: Chadwick Samuel & Sons, cotton spinners and manufacturers, Britannia St.
1841 directory: Hamer & Lund, cotton spinners, Britannia St.
1841 directory: Kershaw James & Sons, cotton spinners and fustian manufacturers, Peel street. 1850 directory: Ashworth Thomas, Wrigley brook Mill (cotton spinners). 1851: Marked on OS map as Wrigley Brook Mill. 1871 directory: Kershaw James and Sons (velvets and satteens), Britannia mills (cotton spinner and manufacturer). 1875 directory: Kay Richard and Brother, Peel street, and Britannia mills, Heywood. 1891: Marked on OS map as Cotton Mill (disused). Wrigley Brook House is marked nearby on Peel Street. 1907: Building not present on OS map. Notes: It is not yet certain that Wrigley Brook and Britannia Mill are at the same site, although it seems probable. OS maps show no other mill buildings in or around Britannia Street apart from the one marked ‘Wrigley Brook Mill’ in 1851. Wrigley Brook Mill (centre), OS map, 1851. 1848: Large cotton mill marked but unidentified at this site on OS map. 1891: Old mill demolished, new mill built. OS map shows old mill buildings gone, and reservoirs as ‘disused’. 1891 directory: New mill erected by Yew Mill Co, Limited; 107,000 spindles, 508/808 twist and weft, Egyptian and American. 1922 directory: Operated by Yew Mill Ltd.
1928: Marked on OS map as a cotton mill. 1937: Not present on OS map. The mill that preceded Yew Mill, OS map, 1847. 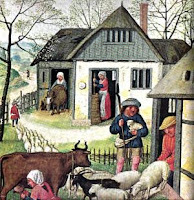 Yew Mill, OS map, 1929.